Searching for a Christmas tree wholesaler? Sturgill’s wholesale Christmas tree farms offers all sizes of Christmas trees and the best varieties of evergreens. We have tabletop Christmas trees and smaller, 2 foot Christmas trees available for sale. You can order any number of trees per size with your order. Give us a call to find out this season’s wholesale Christmas tree prices and get your order in early. We grow quality Fraser fir Christmas trees as well as White Pine Christmas Trees. Most Christmas trees grow about 2 feet a year. Our 2 foot Christmas trees are essentially the same as the table top Christmas trees that we offer. They are small in size and can fit on top of a table or mantelpiece. You might be wondering, how long does it take to grow a 2 foot Christmas tree? Well, about a year, sometimes two depending on the seasonal temperatures and rainfall. Fraser firs require between 75 and 100 inches of rain each year to grow. They grow the best in our region of the Appalachian Mountains where the soil moisture and temperature is optimal for their growing. 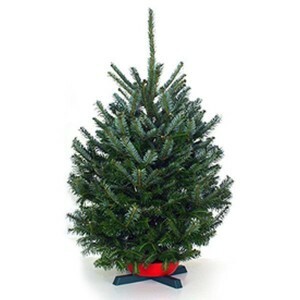 We sell 2 foot Christmas trees and wholesale tabletop Christmas trees and we ship them all over the country. Give us a call to order 2 foot Christmas trees and other sizes. We produce all sizes of wholesale Christmas trees including 4 foot Christmas trees, 5 foot Christmas trees, 7 foot Christmas trees as well as the larger, 12 foot Christmas trees. We have grown taller trees than 12 feet as well, send us a message or give us a call to discuss the details for buying the larger trees.